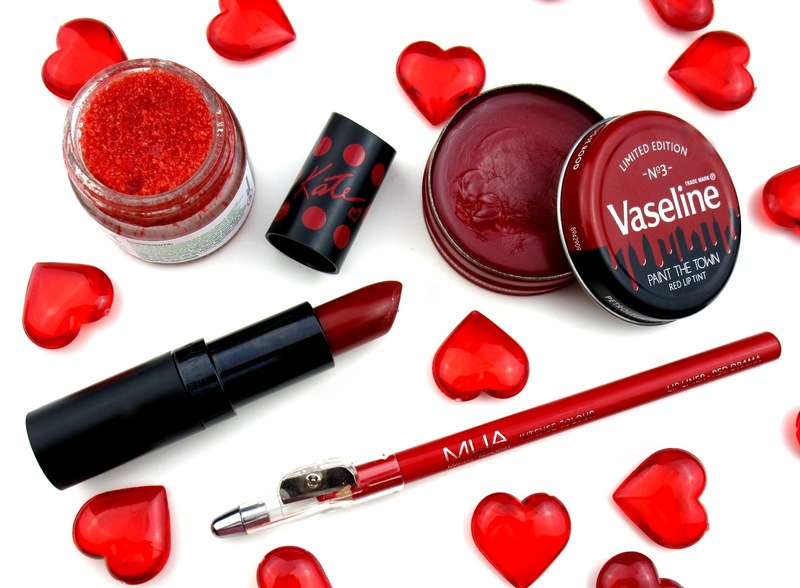 With Valentines day fast approaching it's time to dig out those red lippies and get your inner Marilyn Monroe on he he, so today I thought I'd share with you all my favourite red lip products going from the preparation, moisturising and then the lipstick it self, enjoy beaut's! Firstly is the all important prep because lets face it nobody wants dry flaky lips on or around Valentines day do they? To get my pout in tip top condition I like to start with a lip scrub and the one I'm using at the moment is my Lush Santa's Lip Scrub, it might not be Christmas anymore but this particular lip scrub is quite fitting for Valentines, not only does it polish my pout to perfection but it contains cute little edible love hearts within the scrub which is very Valentines-ish. 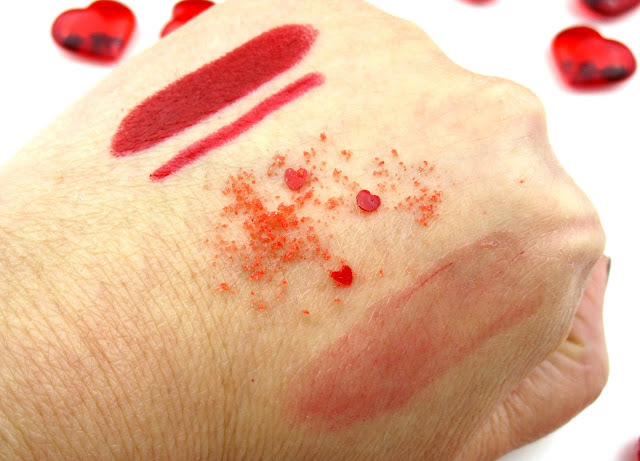 Once the scrub has gotten rid of any flaky, rough skin on and around my lips I like to give them a soft dose of moisture, the scrub already contains jojoba oil and extra virgin coconut oil which are very good at deep moisturising so I like to pop something light on to prep my lips before I line and apply my lipstick. Next I like to line my lips and completely fill them in with the liner too, this not only helps to perfect the shape of your lips but it increases the staying power of your lipstick and prevents bleeding which red lipsticks tend to do. I honestly cant recommend MUA's offering enough, it's only £1.00, it apples creamy yet sets matte which stays in place a good 4-5 hours, the colour is a true bright red shade with a blue undertone so it also makes your teeth look super white which is always a bonus. Lastly it's the all important lipstick and one of my all time favourites reds is Rimmel's Kate Moss Lipstick in the shade 01, Ive actually got two of these lipstick because I love it that much! 01 is a gorgeous blue toned red shade which again really helps to make your teeth appear a lot whiter, it really has that vintage glam look once its applied to the lips and just looks so beautiful. The formula is very impressive, its highly pigmented, applies to the lips comfortably and feels very creamy, it has a sateen finish and has a fully opaque coverage. A definate winner in the red lip department that's for sure! Whats your favourite red lip shade beaut's! I'd love to know! Kate Moss lipsticks are always amazing, great picks!